Stiltz Home Elevators offer a simple and easy way of moving between the floors of your home with our unique residential elevator. It is available as an attractive and affordable alternative to a stair lift, by installing a Stiltz Home Elevator; it means you can stay living independently at home. Whether you live in a townhome, modern colonial or waterfront condo, our residential elevators can be installed in virtually any two-story property in the USA thanks to its special features. 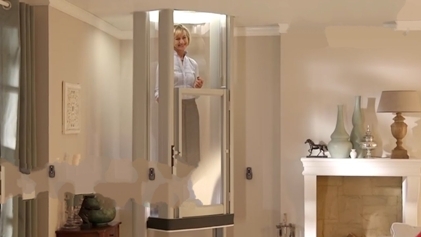 Unlike traditional home lifts, Stiltz Home Elevators are compact, require no hydraulics or load bearing walls and can be fitted within a day. Our self-supporting elevator lifts are powered by electricity and plug straight into a domestic plug socket. The lifts travel on dual rails and include all the safety features you would expect from a product which has been engineered to the highest standards. Typically, it takes just 30 seconds to move between floors in one of our home elevators which are whisper quiet and are very useful for carrying heavy luggage, laundry or even the family pet too! Our residential elevators provide homeowners with a great way of ‘future proofing’ there and home and can add value to your property. This lift is also available for two or three persons at a time.